It's not uncommon for a patient or one of their family members to produce a firearm when they learn I have an interest in shooting. Usually I quickly check the chamber, then inspect the weapon and return it to it's owner, who regales me with tales of it's legendary accuracy, or the number of cottonmouth water rattlers it has exterminated. Duffy was one such family member. He was a craggly faced old man with bright blue eyes peering from underneath his weathered ball cap. I had been working to heal a decubitus on his wife's hip for over a year. Duffy lavished the most gentle care on his wife as he learned to change her dressings. Finally, a year later, I could pronounce the ulcer closed with nothing but skin across the top. Duffy still had his hands full with her Alzhiemer's disease, but at least he no longer had to worry about that wound. As we talked about her continued care, and the strain Duff was under, he turned the conversation to shooting. Then he said "I've got something for you." Duffy went rummaging across a closet shelf, and withdrew a Colt Woodsman. He locked the bolt back with expert skill and handed me the weapon grip first. 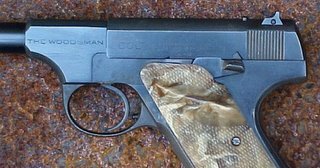 The pistol was hardly original. 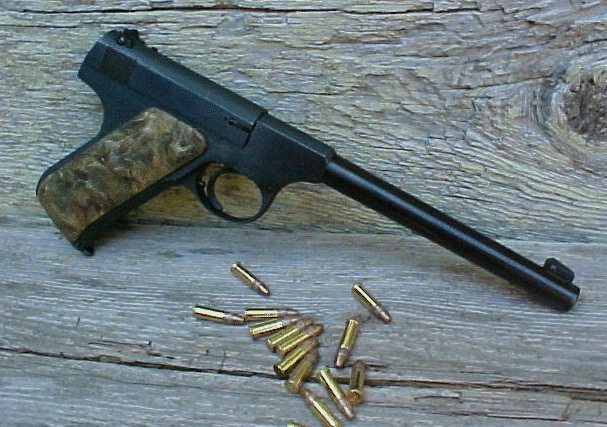 The upper rounds had been blasted, and the pistol had been reblued at least once. The barrel was a Colt replacement barrel. Someone had drilled and tapped a hole behind the trigger to accept a set screw, which served as a trigger stop. The grips were some swirled plastic panels. The pistol had been stored in a floral carved holster. Duffy went on to tell me how he had literally shot the previous barrel out of this pistol. He had replaced the springs at least twice. He told me it was his wager gun, that he would bet his friends that he could hit something far away, and then bring home gambling money as well as a rabbit or squirrel. The old man had purchased this Woodsman new "right before the war" and had used it to put food on the table and money in the bank. He chuckled and said he would have used it on "them damned Japs" too, if he had the chance. I asked Duff when the last time he shot the pistol was. He said he did not know, it had been a while. His eyes lit up and twinkled when I told him I had some .22 ammo in the car. We did not have any suitable targets so Duff rounded up a few shell casings and instructed me to line them up on an old Farm-All tractor rusting in the Louisiana sun behind his house. After I walked back to Duff, he loaded five rounds in the magazine. He stated "I don't reckon I'll need no more'n this." Duff fired the little Woodsman five times, sending the shell casings flying. I spent almost a half hour looking for the punctured brass among the weeds. When I had our improvised targets collected, I went back to where Duff was snoozing in a lawn chair, the pistol in his lap. When he woke, he smiled and handed me the Woodsman. I hesitated and the old man said "Go on boy, it's yours now. My son doesn't want it, and I don't need it anymore. It's not a gift to a nurse. It's a gift to a friend." I could not refuse a gift such as this. To do so would be an insult. I do not know which I will cherish most, the brass Duff shot that day, or the pistol he gave me. On my way back into town, I stopped by the drug store and paid off the balance Duffy owed on his bill. I hope he never finds out who did that. A wonderful story, and great photos to go with it. If you ever sell that, you will most likely go to the Hell of Eternal Torments. Wow. It must be really rewarding to work in a profession and with people like that. That's a great story,well written and touching. When I was a teen some 40 years ago my uncle came over with a woodsman just like yours. It was a second or third hand gun but shot like a tack driver. Someday I want to get my own and drive tacks or maybe shell casings. Enjoy! Your story was needed and made my day, for several days. We're really losing something special here, and the 'firearms fellowship' is taking a hit, when we lose someone such as this. The bell tolls for thee, indeed. Xavier, I'm glad he found someone trustworthy to pass on the hardware. It is up to us all to preserve and pass on the traditions. Beautiful story. I am getting misty. Duffy bestowed upon you one of his most precious items, given in a gesture of pure kindness. Your act of paying his bill will bestow a thousand blessing upon your soul. I hope one day you get the opportunity to pass that gun on to another dear friend in a similar fasion. Great story, it made my day. That's the best way to get a gun. My first gun was a Beretta .22 Bobcat, given to me by an unclewho could barely stand, not even 50, but with a 2% chance of suriving the year. I carried some spent casings in my pocket for luck. That's an amazing story. One of the nicest I've seen on any blog. It’s another blinga xavier. Brought a lump to the throat and the comments brought a tear to the eye. It gives one a great feeling for the rest of the day… the week even. Great writing and photos thanks for sharing part of your life with us. I hope you find time to read this. 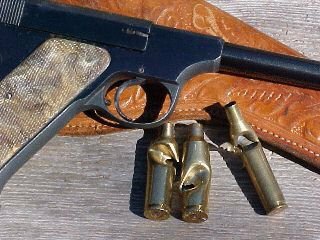 I have just "re-discovered" the pistols that I have in my closet and I found your blog in doing some research. Anyway, My wife and I have spent a few days recently in two different hospitals in the Northwest. Who is the nurse working on the floor? Who has the authority to help me or my wife manage a very scary situation? Everyone looks the same, I mean in some non-descript "scrubs" that may have been purchased at Target or Wal-Mart. Everyone, the housekeeping staff, the kitchen workers, the case workers all look the same. It is scary.Even the secreatries in the offices are wearing the "scrubs". What happened to the white uniforms and caps that RN's and LPN's used to wear? I know the answer. The dummies that run the hospitals saw an opportunity to cut costs and not fund nurse's uniforms. Am I right? The hospital that goes "old school" with professional looking white nurses uniforms will RULE. That will creat more respect for nursed with the doctors and hospital management. There may yet be hope for humanity.